A common complaint from customers using the Fixed Assets module in Dynamics 365 for Finance and Operations (D365FO), is the lack of suitable out-of-the-box reports to cover their basic reporting needs. Something as simple as a roll forward report would be great, if it existed. Well it does! It’s kind of ‘out-of-the-box’! It’s just hidden. D365FO has a Fixed Asset Roll Forward report available, but it does not naturally show up in the standard Fixed Assets module’s Inquiries and Reports>Transaction Reports section. The report uses an Electronic Reporting (ER) framework (a source of reporting not widely known or explored) and needs to be downloaded from Lifecycle Services, as well as a series of hotfixes to apply if the customer is still on D365FO July 2017 (7.2) edition. Before we go through the step-by-step process, it would be beneficial to review the links below for short Microsoft documents on the Fixed Asset Roll Forward report as well as on downloading Electronic Reporting configurations from Lifecycle Services. Go to Organization administration > Electronic reporting. In the Configuration providers section, select the Microsoft tile. 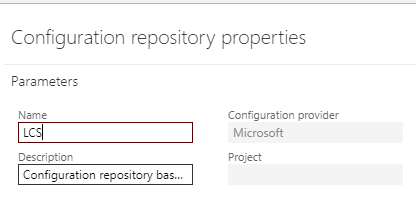 On the Microsoft tile, click Repositories. 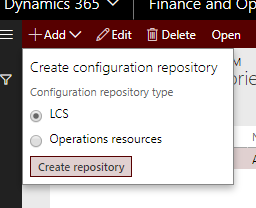 On the Configuration repositories page, in the grid, select the existing repository of the LCS type. This particular environment did not have LCS as a listed type. a. Click Add to add a new repository. b. Select LCS as the repository type. d. If prompted, follow the authorization instructions. e. Enter a name and description for the repository. f. Click OK to confirm the new repository entry. g. In the grid, select the new repository of the LCS. Click Open to view the list of ER (Electronic Reporting) configurations for the selected repository. In the configurations tree in the left pane, select the ER configuration that you require. In this case, select both Fixed assets model and Fixed asset roll forward – by selecting the Child (FA roll forward). On the Versions FastTab, select the required version of the selected ER configuration. Click Import to download the selected version from LCS to the current Finance and Operations instance. 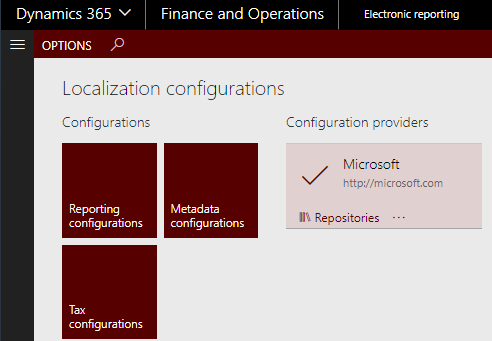 Note: The Import button is unavailable (grayed out) for ER configuration versions that are already present in the current Finance and Operations instance. The list on the left side is also grayed out (unbolded) for those that have been imported. You will now find the Fixed asset roll forward report by going to Fixed Assets > Inquiries and Reports > Transaction Reports. The report is lacking in some respects – there are no fields in the report for such things as the Location and Financial Dimensions that are attached to each fixed asset. One method of getting those fields into the excel file would be to maintain a lookup table with the fields required (say Fixed Asset number, Location, Financial Dimensions- ‘Default dimension display value’ field from ‘Fixed asset book V2’ data entity) and do a VLOOKUP within the roll forward report. You can do filters in D365FO to generate the report (such as Location = HQ and Business Unit dimension = 001) but those filters won’t appear on the report. I hope that the information on getting the Fixed Asset Roll Forward report onto the D365FO Fixed Assets report menu has been informative. Please contact us if you have any questions about Microsoft Dynamics AX or Dynamics 365 for Finance and Operations.